I always enjoy Ali McNamara’s books having read one over each of the past few summers. You can click to read my reviews of The Little Flower Shop by the Sea, Letters From Lighthouse Cottage and you’ll find my review of The Summer of Serendipity in amongst my summer reading mini-reviews here. So I jumped at the chance to read this latest one and who could resist with that gorgeous cover of the vintage campervan? 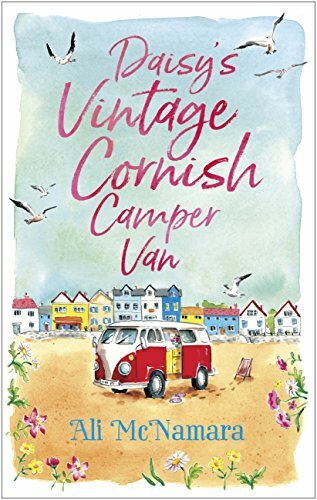 Daisy’s Vintage Cornish Camper Van was a welcome return to the delightful Cornish town of St Felix, the setting for The Little Flower Shop by the Sea and I was delighted to spot passing references to some of the characters from that book too. Ana’s best friend and fellow 1980s music afficionado, Daisy, has recently died and has bequeathed Ana a vintage campervan. When Ana travels to St Felix to collect it, she discovers it is far from in a driveable condition. But mechanic Malachi, assures her he can get it roadworthy and back to its original glory in a short while. As he begins to renovate the van, he comes across a real treasure trove of old postcards, love letters written from Lou to Frankie. This has obviously been a secret love as the postcards have never been sent but together they represent more than fifty years of love. Daisy becomes determined to reunite the cards with the writer and the intended recipient. The book is full of wonderful characters and I loved the bakers Ant and Dec (yes, really!) who had a talent for knowing just what their customers wanted. They were quite the double act like their namesakes and I do wonder whether they might feature in a future book? Malachi was a bit of an enigma. Why did no-one in St Felix seem to know who he was and what was that strange tingly feeling Ana got if their hands touched? And then of course, there were the strange things he sometimes said. Jess, who worked in the antiques shop, seemed very keen for Ana to get to know Noah. His aunt had died and left him shop and he was unlikely to have been in St Felix otherwise. Jess appeared at just the right time when he needed help. Was fate playing a hand in all these people being in the same place at the same time? Daisy-Rose though, the campervan, was the quiet star of the show and perhaps even had me convinced (as my husband keeps trying to) that it would be wonderful to travel in an old van. As with all of Ali McNamara’s books there is a hint of something magical at work. As well as Malachi being rather mysterious, there was the mystery of the postcards too. Quite often on her search, Ana would come across what seemed to be a sign that she was on the right track and usually that sign was linked to the 1980s. It was lovely to watch Ana begin to live for herself again and find a focus to her life trying to solve the mystery of the postcards. I loved every page of Daisy’s Vintage Cornish Camper Van. It was a delight to read with its mix of mystery, magic, great characters, romance and with such a gorgeous setting. Another winner from Ali McNamara! Ali McNamara attributes her over-active and very vivid imagination to one thing – being an only child. Time spent dreaming up adventures when she was young has left her with a head bursting with stories waiting to be told. When stories she wrote for fun on Ronan Keating’s website became so popular they were sold as a fundraising project for his cancer awareness charity, Ali realised that not only was writing something she enjoyed doing, but something others enjoyed reading too. Ali lives in Cambridgeshire with her family and two Labradors. When she isn’t writing, she likes to travel, read, and people-watch, more often than not accompanied by a good cup of coffee. Her dogs and a love of exercise keep her sane! I am unfamiliar with Ali McNamara, but I will be checking my local library to see if I can get her books. I recently made my first trip to Cornwall and am interested in books set there! Thanks for your review!